Wood countertops are essentially wood furniture which performs beautifully with normal use and care, but which may scratch, dent and show signs of wear under heavy use. Don’t worry! A great feature of wood countertops is that almost anything that could go wrong can be repaired. Daily cleaning with soap and water usually isn’t necessary. Use common sense during food preparation, of course, but for normal contact it’s best to do less. You might occasionally wipe the surface with a dry or damp towel, but avoid heavy soaking or scrubbing. About once a week (or as needed), clean the worktop with our Gentle Wood Wash or other mild soap. Gentle Wood Wash is a unique ph-neutral soap that is specially formulated to care for our Luxury Oil Finish. It is packaged in Concentrate form. You will need a generic 32oz. spray bottle. Add two capfuls of concentrate (1 capful per 16oz.) and fill with water. Shake gently. Directions for use: Lightly spray the worktop surface, wait a few minutes, and then wipe clean with a clean damp cloth to remove dirt and soap residue. Dry thoroughly. Do not heavily soak the surface with water, and do not use abrasive pads or scrapers as these will ruin the countertop finish. For deeper grime only, add one additional capful of concentrate to soap mix. Use this extra-strength mix for stain removal only and not for regular cleaning. See reverse side for easy annual maintenance of Oil finishes. Wipe up spills as quickly as possible. The finish is moistureresistant but not waterproof. Place hot pots and pans on potholders or trivets. Place a shield of tinfoil beneath countertop appliances such as slow cookers and fryers. 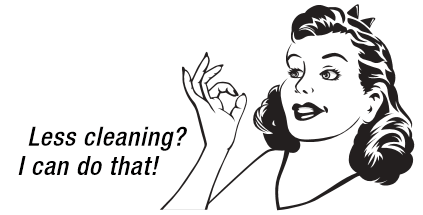 Don’t use harsh cleaners, bleach, solvents, furniture polish, oil soaps, scrubbing brushes or scouring pads. 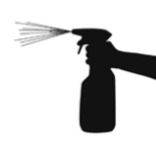 Never use Lysol-type sanitizers as these may react with oil finishes. Constantly maintain indoor air temperature at 65-80°F and humidity at 50-60%. In winter, home heating systems may cause wood to be dry and brittle and to shrink. As the wood shrinks, tiny hairline cracks may appear. These harmless cracks are not product defects, but are a normal result of excess moisture loss, and they will usually disappear when humidity is increased or when warmer weather returns. DO NOT use radiant/infra-red heaters near wood tops. These may cause warping and cracking. Oiling is Quick and Easy! When should I oil my wood worktop? About once a year or as needed. There is no universal oiling schedule. Some tops might last a year or more between re-oilings, others only for months, especially in dry climates or with heavy use. The Water Test. When the finish begins to dull and has an uneven sheen, dribble a small puddle of water onto the surface. If it begins to soak in within 15 minutes, it’s time to re-oil. If the water does not soak in, the finish may only need buffing. We recommend Oiling in the evening so that the oil can dry overnight. Clean and thoroughly dry the worktop. The surface must be dry – oil and water do not mix. Vacuum the Applicator Pad to remove loose fibers. Stir the oil until fully blended (do not shake). Luxury Oil contains waxes which settle in storage. These waxes are the backbone of your worktop’s protection. If these waxes aren’t blended into the oil, your worktop won’t be water-resistant. Apply the Oil in a THIN even coat using the Applicator Pad. Avoid drips at edges. Take care not to get oil on any other surface. Close oil container tightly when not in use. Oil-soaked rags are combustible. 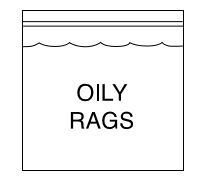 PLACE OILY RAGS IN A ZIP-SEAL PLASTIC BAG AND SOAK WITH WATER FOR DISPOSAL. Wash the Applicator Pad with dish soap and air-dry before storing in a plastic bag for re-use. 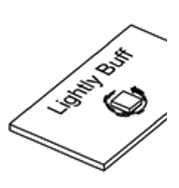 BUFFING - only as needed! The surface may develop shiny or dull spots after oiling or with regular use. This is normal with finishes which contain wax. Blend the wax by gently buffing the surface with the white polishing pad. Light scuff marks can also be buffed out with the white pad. Deeper scratches and stains can be repaired with the grey polishing pad as noted below. Once or twice a year, you may choose to apply another very thin coat of oil to refresh the surface. Follow oiling instructions exactly and wipe thoroughly. Don’t worry! A great feature of wood countertops is that almost anything that could go wrong can be repaired. Deep scratches and stains can be removed by sanding the spot with the grey polishing pad in the direction of the woodgrain. Remove dust. Apply oil only in the spot of the repair. 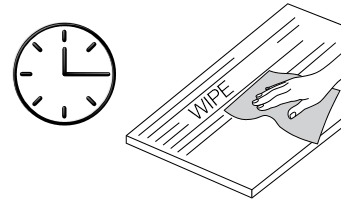 Wait 15 minutes, and then wipe off excess as directed above. Let dry overnight, and then blend the wax “halo” around the repair with the white polishing pad. If you also plan to re-oil the entire worktop, wait 7 days for the repair to cure before oiling again.